This morning we received in a shipment of some new Disney X Slick X New Era caps. If you remember a few months ago we had a huge shipment of these, each designed by a different but well known street artist. Slick, who hails from Hawaii originally is one of the most sought after street / graffiti artists so this is a guarantee sell out. 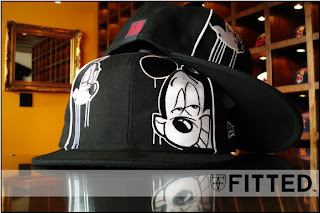 The hat comes in black and features Slicks reinterpretation of Mickey Mouse on both the right and left side of the front, with white piping on either side. The back features Slick’s signature. These are very limited in quantities so please act promptly and cop yours before they’re gone for good! Part of the mid-2000s hip-hop movement that found kids in all-over prints rapping about their shoes and their favorite forms of transportation (which often weren’t cars), the Cool Kids proved to be both an Internet and live show phenomenon. The duo of Mickey Rocks (born Antoine Reed) and Chuck Inglish (or Evan Ingersoll) met in mid-2005 after Mickey came across some of Chuck’s beats online and liked what he heard. They met up in their Chicago-area homes (where Mickey was born and raised; Chuck lived in Mount Clemens, MI, about 30 miles north of Detroit, until he was 11) with the intention of making beats to sell to other artists, but soon realized their own measured, smooth flows and lyrics fit best over their production. In 2007, though they had yet to release any material outside of what was posted on their /MySpace site or MP3 blogs, the group started receiving a lot of press attention from fellow-Chicagoans and tastemakers /Pitchfork, who invited them to play at their summer festival. This led to a spot at New York’s CMJ Music Marathon, where they shared a showcase with DJ A-Trak — who offered to put out their EP — and an opening spot on M.I.A.’s solo tour. 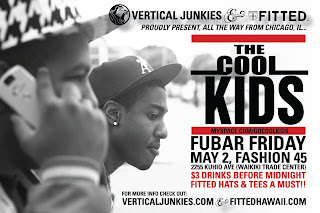 However, that same year, the Cool Kids signed to Chocolate Industries, who released their debut, The Bake Sale EP, in January 2008, with plans for a full-length to follow. When it comes to tattoos & Hawaii, one artist always comes up in any body-ink related conversation – Mike Ledger. The man is considered a legend as far as tattoo artists go, ranking somewhere in the top 5 in the World. He’s done body artwork for numerous celebrities and traveled the world and studied under the most skilled artist. His roots started in New York City, but those same roots are now firmly grounded here in Hawaii. Straight Up this Dude is ill and his work speaks for it self. Even though his books are known to be at least a year deep for new clients, We were fortunate enough to collaborate with Mike Ledger on our first FITTED cut & sew piece, in the form of a crewneck sweater. 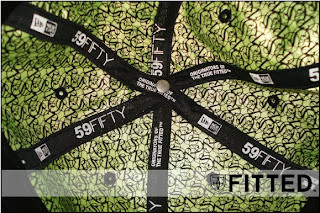 Those who have walked through the doors of FITTED may remember the “Fist City” piece etched on the front of our door – What you might not have known is that Mike was the Mastermind behind that art! 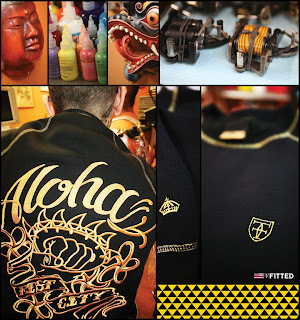 The detailing on the sweater is top notch: all black double dyed with metallic gold top stitching, embroidered on The back is Mike Ledger’s “Fist City” artwork which includes, of course, a fist with an array of shark’s teeth surrounding it (think: a Hawaiian version of a pair of brass knuckles). 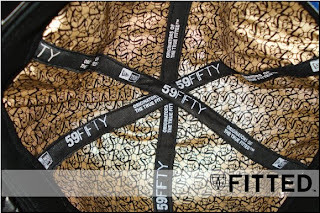 On the left chest area of the sweater is our FITTED crest in metallic gold stitching, and the left sleeve (near the wrist) is our FITTED crown. There are ONLY 100 of these exclusives sweaters available, where Mike has signed and numbered 1 – 100 on each hang tag. 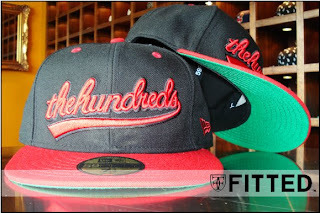 Just received in another delivery of The Hundreds’ new line of New Eras, these being the script ones. 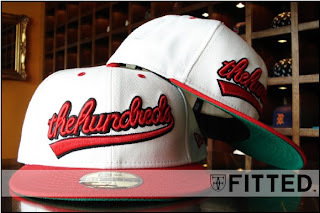 2 different colorways: all black hat with a red brim and green underbill and “The Hundreds” in script in red; the second colorway is an all white hat with a red brim and green underbill as well as “The Hundreds” in red script. 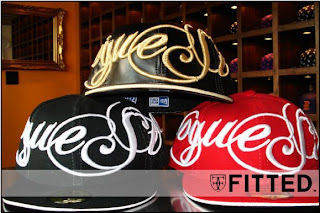 These are fire and will definitely sell out quickly so make some quick decisions & get down ASAP to get yours! 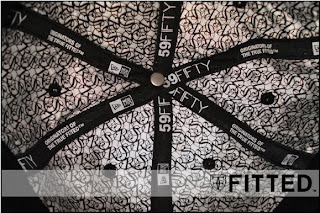 As always, these are super limited in size / stock availability. Phone orders will be welcome for these after 12 PM depending on what we have left. 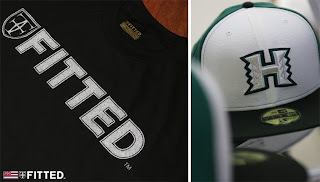 Sadly, this Saturday (4/26) is the day we are releasing the LAST custom UH– along with a matching t-shirt. On the bright side of things, this particular UH hat is crazy! Here are the specs: the front two panels are white, the back four panels are green and the UH logo itself consists of silver with a green and black stroke. The New Era logo hit is in silver as well. The t-shirt that goes along with this is an all black tee with a REFLECTIVE FITTED + Crest logo fill, the back features our crown also in a REFLECTIVE fill. REMEMBER, this is THE LAST cap in our UH custom program, BUT we will still be bringing you UH hats – the catch being that they won’t be seen in crazy color combos anymore, we’ll be sticking more to tonal / traditional colors. 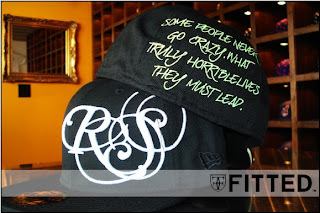 Come down and get yours (both hat & tee) to add to your non-stop growing FITTED collection. For those unbeknownst to the lifestyle of Hawaii, or who have never visited our state, most would think it’s all about beautiful sunsets, pristine beaches and gorgeous, exotic women. All of the aforementioned are true – however it’s not all palm trees and hula skirts. Oahu also does have a dark side to it, sans the major crimes that may plague the Mainland – we do have our own concrete jungles, and there is a reason that our state is nicknamed “Fist City.” With that said, we present to you this pack, which releases TUESDAY (4/21). This consists of, as usual, a custom hat with a matching t-shirt. This tee is a whole new design, printed on all white and features a collage of artwork: palm tees, tigers, giraffes, tropical flowers and clear, blue waters. What you typically would find in a paradise such as Hawaii. On the bottom of the artwork is “HONOZOOLU,” the back of this shirt features our crown with the same colors on the front of the tee laid inside. Along with this brand new shirt is a custom Florida Marlins New Era. Here’s the details on this cap: the front two panels are white, the back four panels are an aqua blue, with an aqua blue brim. The underbill and top button both are navy blue with contrasted eyelets. 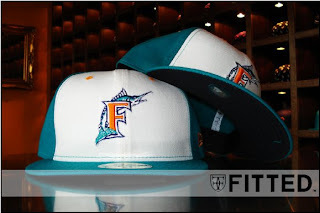 The New Era logo is white, and the Marlins logo features teal and orange, which sets off the matching shirt perfectly. You do not want to miss this, you know the drill: First come, first serve – no holds. Phone orders taken after 12 PM Hawaii time. See you all there on TUESDAY! 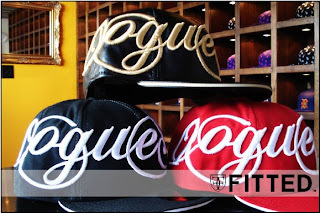 Aloha All..Rogue Status Now Available…..